Carpal Tunnel Syndrome is one of the most common nerve disorders around and can affect both hands and wrists on a particular person. It disables a primary nerve that causes the fingers to be numb, sensation in the hand to be lost, and a mild-moderate tingling pain or burning sensation extending up to your forearm. Carpal Tunnel currently affects around 2-3% of Americans and is very treatable. Generally, Carpal Tunnel Syndrome appears as a numbness and tingling in the fingers. Occasionally it will be felt in the thumb, index, middle, and ring fingers, but does not have to be felt in all of them. There are many other things that can cause any of these symptoms, so before diagnosing yourself with Carpal Tunnel Syndrome, it’s best to see a doctor to determine what your options are for dealing with the pain. In most cases, surgery isn’t necessary for treating Carpal Tunnel Syndrome. However, if symptoms don’t improve with other treatment options, surgery may be required to reduce the chance of permanent nerve damage or the progression of atrophy. If pain disturbs sleep or daily function, it may be time for surgery. 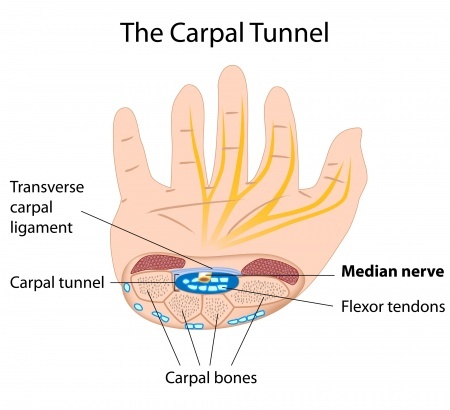 While the typical Carpal Tunnel surgery will be an endoscopic procedure done on an outpatient basis, this will vary depending on your diagnosis and potential results from a nerve test. If you are experiencing symptoms that may be related to Carpal Tunnel Syndrome, Dr. Tuwiner at Virginia Center for Neuroscience today at (703) 293-5244 for more information.